The Armed Services Vocational Aptitude Battery, or the ASVAB, measures your aptitudes in domains that pertain to the United States Armed Forces. Your score determines your qualification for enlistment, while a breakdown of your score is a factor in determining your placement in the military. The ASVAB is a multiple choice test containing 10 sections that consist of four domains: verbal, math, science and technical, and spatial. The ASVAB is scored on a 0 – 99 point scale. Your score is broken down into subtest scores to determine your qualification areas. 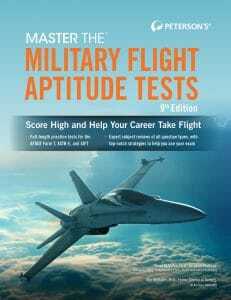 Each branch of the military has minimum scores in each of these qualification areas that must be met in order for the test-taker to be eligible to enlist in the Air Force, Army, Marine Corps, or Navy branch. Students enlisting in the United States Armed Forces. While high school students are the most common test-takers, anyone eligible for enlistment may take the exam. 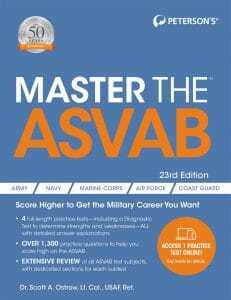 Should I prep for the ASVAB? How much? The test is 3 hours long. With anything of that magnitude, a little practice is in order. You’ll want a qualifying score to be eligible for enlistment, and a higher score helps you get the job and bonuses you want. How do I register for the ASVAB? ASVAB registration takes place through a military recruiter. Find and contact a recruiter through the Department of Defense’s Today’s Military website. 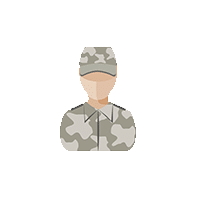 If you are deemed qualified, the recruiter will set up a time for you to take the ASVAB at the nearest Military Entrance Processing Station or Military Entrance Test site.